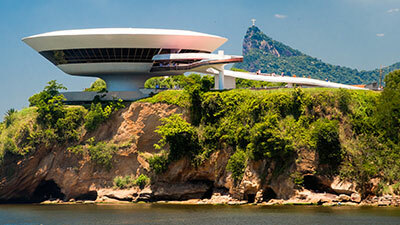 Brazil has gone through many changes and has an architectural history spanning over 500 years. By visiting the various cities and locations that were most influential and powerful at different times, you can certainly see the changes in the architecture. The Portuguese were the first to colonize Brazil in the 16th century. 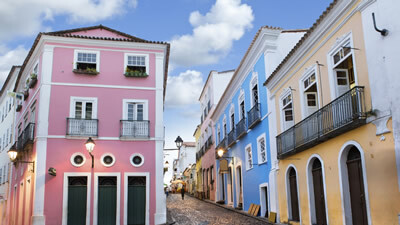 The cities and towns that they built at the time were in the style of Portuguese colonial architecture. The buildings of the time are distinct with their symmetry, their box like construction, and their alcoves and recessed windows. Constructed simply from stone and mortar, then usually covered with plaster to form a smooth finish. These walls can then be left white, or painted bright colors. The best place to see this type of architecture is in the city of Salvador. The multi-colored colonial buildings that line Salvador’s streets show a glimpse of the past and are beautiful to behold. The Salvador Municipal Palace, built in 1549, is also a prime example of Portuguese colonial architecture. This colonial style prevailed and evolved as the architecture evolved across the ocean in Portugal. Coming into the 18th century, a more Baroque and Neoclassical style started to emerge in Brazilian architecture. The best places to see Baroque architecture are the towns along the gold trail, especially Ouro Preto. Here, you will see the buildings start to take a very ornate form, with rounded corners, paintings incorporated into walls and an opulent use of natural light and airflow. 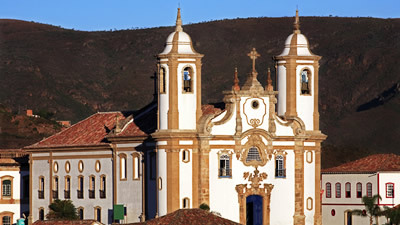 A good example is the Igreja de São Francisco de Assis located in Ouro Preto. Neoclassical architecture can almost be described as the exact opposite, which pays homage to the classical stylings of ancient Rome and Greece. Large multistory columns, grand triangular roofs, and a liberal use of white soapstone, limestone, or marble are the hallmarks of Neoclassical buildings. While no single city can be defined as purely Neoclassical, some good examples are Rio’s Museu Nacional de Belas Artes, Belem’s Teatro da Paz, and Manuas’ Teatro Amazonas. The modern age is when Brazil really started to define itself in its architecture. The most famous architect — designer of modern marvels such as the Edifício Copan in São Paulo and the entire city of Brasília — is Brazil’s own Oscar Niemeyer. His buildings are characterized by the use of concrete and free-flowing curves. The best place to see modern architecture, including many examples from the father of modern architecture, Oscar Niemeyer, is Brasília. The presidential palace, is a two story glass and concrete masterpiece, with flowing curved supports forming the façade on all four walls. The Cathedral of Brasília is a concrete hyperboloid marvel, and the solemn towers, bowl and dome of the national congress are all prime examples of modernism.